Dhaka, Mar 19 (Just News): The Bangladesh Nationalist Party (BNP) on Monday alleged that its chairperson Begim Khaleda Zia was denied justice by the Supreme Court and its order staying her bail till 8 May has reflected the government's desire. In his reaction after the SC order keeping Khaleda Zia's bail suspended, BNP general secretary Mirza Fakhrul Islam Alamgir said democracy and state have come to the edge of ruining. "We've been denied justice by the Supreme Court, which was the symbol of hope and the last resort of people," he said. "We're saying with anger that the Supreme Court's order (on Khaleda's bail) has reflected the government's will," the BNP leader said. He said, "Khaleda Zia and we have been denied justice by the country's apex court." Mirza Fakhrul gave the party's official reactions about two hours after the SC order on Khaleda's bail, at a press conference at the BNP's Naya Palton central office. In the morning, the Appellate Division of the Supreme Court ordered keeping BNP chairperson Khaleda Zia's bail stayed till 8 May in the Zia Orphanage Trust case in which she was sentenced to five years' jail by a lower court. Mirza Fakhrul alleged that the government is obstructing the legal process very consciously to prolong Khaleda Zia's stay in jail. On 8 February, the Dhaka Special Court-5 of Md Akhtaruzzaman convicted the former prime minister and BNP chairperson and sentenced her to five years' imprisonment in the Zia Orphanage Trust graft case. She was then sent to old central jail at Nazimuddin Road in the city. Leaders and activists of BNP and its associate bodies will stage demonstrations across the country on Tuesday demanding the release of its chairperson Khaleda Zia from jail. The party also rescheduled its today's planned rally at Suhrawardy Udyan in the capital for March 29 as the Dhaka Metropolitan Police authorities did not respond to its application seeking permission for the programme. 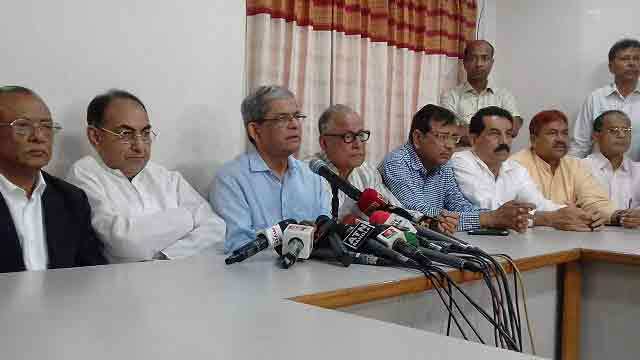 BNP Secretary General Mirza Fakhrul Islam Alamgir came up with the announcement at the press conference. He said their party's all district and metropolitan city units will demonstrate tomorrow (Tuesday) seeking their chairperson Khaleda Zia's release from jail. In the capital, Fakhrul said the similar programme will also be observed at every thana here on the same ground. He said though they had a schedule to hold rally at Suhrawardy Udyan today, the DMP authorities did not give them permission to hold it. The BNP leader hoped that the authorities concerned will allow them to hold the rally on March 29. He said a BNP delegation went to the DMP office on Sunday, but no one of the police authorities met them. "I personally phoned at least 10 times the DMP authorities, but they didn't receive it. So, now we've decided to hold the rally on March 29"
Fakhrul alleged that the government is trying to provoke BNP so that they change their stance of peaceful movement. But we won't get provoked. We can assure you we won't fall into the government's trap." He called upon the people of all walks of life, parties and social organisations to get united to overcome the current political crisis. "There's no alternative to forging a national unity to face the current awful situation.